On my back pantry shelf are special jars full of treats. An old fashioned way to preserve fruits to be used in the winter. The jar on the right holds what we call "Tutti Fruiti" -- brandy, sugar and fruits that marinate to be used over ice cream and pound cake. In Germany, it's called rumtopf and has it's own special container. In France, it's called Bachelor's Confiture. 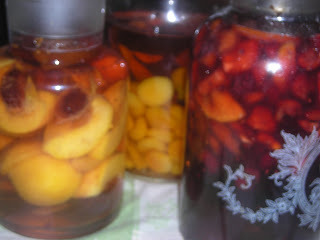 The jar on the left holds peach cordial -- vodka, sugar and peaches which when done makes a wonderful after dinner sip. (The peaches themselves go into the tutti fruiti jar). 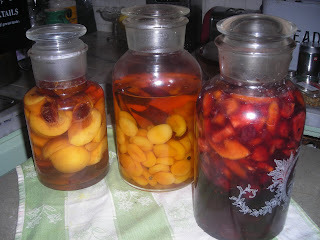 The jar in the middle holds the apricot liqueur -- vodka, sugar, spices and dried apricots. The bonus with that liqueur is that when the liqueur is done and bottled, the apricots can be dried off, half dipped in chocolate and these boozy chocolate dipped apricots make great Christmas gifts in a fancy tin. I love these lab jars for my concoctions. For you can see the fruits in the jar and they make an attractive display on the pantry shelf. These treats are certainly easy enough to make and not only do they make for a great after dinner sip but bottled, they make great Christmas gifts as well. When the first strawberries come to garden or market is the time to start your tutti fruiti. A pint of the very best brandy is poured into the jar, then 2 cups of strawberries are sliced in half and added and two cups of sugar on top of that. Stir every day with a long handled wooden spoon until the sugar is dissolved. As fruit comes in season, two cups of fruit and two cups of sugar are added to the jar. Pineapple (peeled and cut into cubes), cherries (black and sweet and pitted), apricots (cut in half), peaches (skinned and cut into chunks), and blackberries (added whole). Wait at least a month for the flavors to marry before adding ladlefuls to ice cream or pound cake. Grapes are too thick skinned to use -- apples and pears too bland. A handful of blueberries if you wish but no more. I love those lab jars! We had a crock of rumtoph on top of our refrigerator when I was a child.